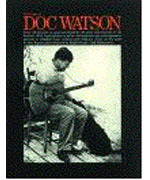 A superlative collection, reflecting the same wide variety of songs that you'd hear at any Doc Watson concert. In addition to words, melody, and chord names, more than half the book is filled with guitar transcriptions and standard notation. Here, at last, is the definitive lesson by one of the greatest guitar flatpickers of all time! In a wide-ranging and detailed session, Tony Rice demonstrates his world-famous technique, gives invaluable advice, analyzes some of his best-known pieces and discusses his style, influences, guitars and favorite players.